It is with great sorrow that we advise of the passing of Frances Ronald "Ron" Henry Bailey, 85, who died peacefully on March 1, 2012 after a long and valiant battle with cancer. Ron was born on August 25, 1926, in Morden, Manitoba to Frank and Annie Bailey. In 1951, Ron moved to Atikokan, Ontario with his wife Margaret, where they raised four children. He worked for Steep Rock Iron Mines for approximately 30 years, first as a scaler and then as Pit Foreman. So many happy years were spent in Atikokan where, as a young man, Ron enjoyed fishing, camping, playing baseball with the local league and playing drums with the local band at Saturday night dances. He was actively involved with the Atikokan Legion, both as a patron and life member and, in later years, on the Executive of the Branch. He continued his association with the Legion when, after retiring in 1982, he returned to his hometown of Morden and again served on the Executive of the Morden Branch. Family and friends will remember Ron for his love of music and song, his easy laugh and the honour and humility with which he conducted his day-to-day life. Ron will be greatly missed and fondly remembered with tears and laughter by his close-knit family. 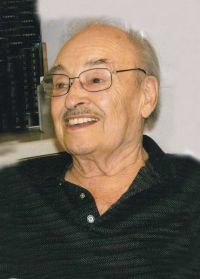 He is survived by his loving wife, Margaret, four children, Rhonda Bailey, Kim Bailey (wife Laurie), Lori Nault (husband Gary) and Coral Matthes (husband Ken), three grandchildren, Ronnie and Jennifer Matthes and Jamie Nault (wife Carly), and great-grandchildren, Wyatt Morin-Nault and Leila Bailey Nault. Marg and family would like to take this opportunity to give a special thank you to the wonderful friends who provided support and comfort during this difficult period, Lyle and Leona, Ron and Pat, Tiny and Arnold, to name but a few, and a special note of thanks to daughter, Rhonda, who went to extraordinary lengths to provide care and assistance to Ron and Marg in their time of need. As well, special mention should be made of Dr. Woelk and the Pallative Care staff whose care and understanding gave Ron the hope and strength to continue his battle to the very end. Ron's life was celebrated on Wednesday, March 7th, 2012 at 2:00 p.m. at Wiebe Funeral Chapel, Morden, Manitoba. In lieu of flowers, if friends so desire, a donation in Ron's name can be made to a charity of your choice.